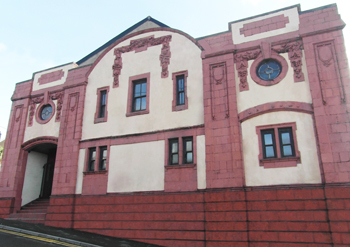 The Savoy Theatre is situated on Collenna Road, in the town of Tonyrefail, in the Rhondda Valley. It is about 30 metres from the High Street, and town centre. 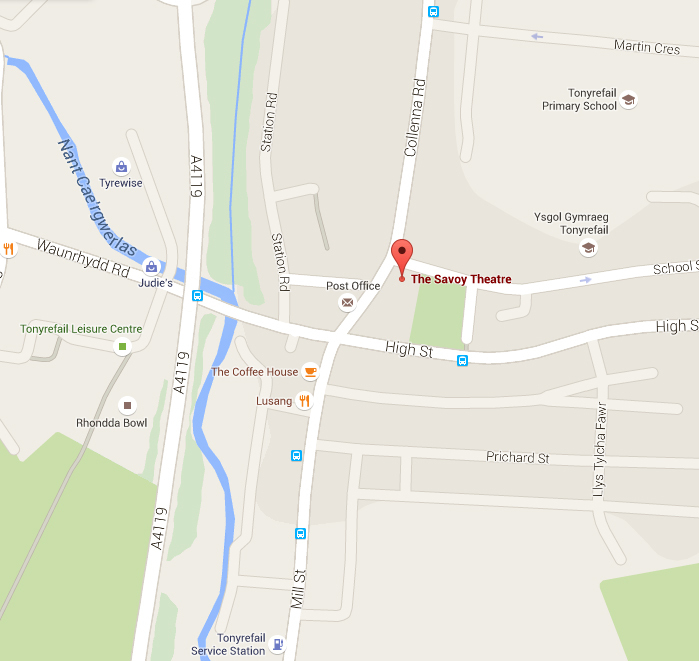 A map (from Google) showing the centre of Tonyrefail, and the location of the Savoy Theatre. There is a small, council-owned car park off nearby Pritchard Street, and also a council-owned car park at Tonyrefail Leisure Centre. Both car parks are about a five minute walk away. *Please Note: The Savoy Theatre is in a residential area, so we ask you politely to park sensibly and not to block the residents' access to their properties. Thank you. Tonyrefail is served by a number of bus services, run by Stagecoach South Wales. These buses make frequent stops in the town centre, which is a two minute walk away from the theatre. Being a Grade II Listed Building, The Savoy Theatre has limited access for the disabled. However access to the theatre can be made via double fire exit doors in the alleyway to the north of the building, or via double fire exit doors in the side yard to the south. Both access points need to be pre-arranged, so that staff can be on hand to open these doors from the inside, and also to assist you if required. For performances, the theatre has 4 wheelchair spaces at the rear of the stalls. From here, disabled patrons have easy access to Front of House areas, fire exits, and toilets. There is no disabled access to the circle seating. At present, the theatre has no separate disabled toilet facilities. However disabled patrons can easily access the ladies' toilets off of the foyer. If a disabled gentleman needs to use the toilet, theatre staff will ensure that the ladies' toilets are vacant for him to use.